For the latest 4.8 release of Newfies-Dialer, there are a raft of new features. Our major milestone is introducing power dialing to Newfies-Dialer. You set the number of agents that will be available, and Newfies-Dialer makes sure that enough calls are made to keep the agents occupied, while not exceeding capacity. 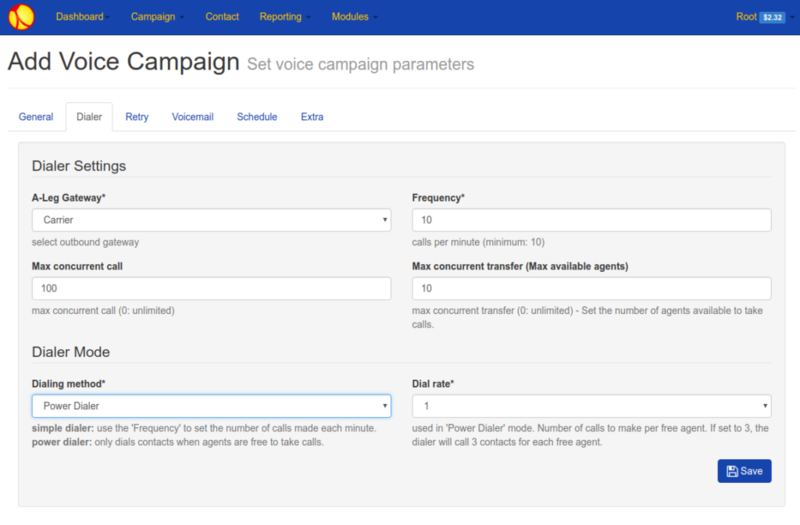 Newfies-Dialer is a power dialer and voice broadcasting system with billing capabilities. The new power dialing mode will make your agents more productive by keeping them talking to leads and prospects for longer. Adding power dialing to Newfies-Dialer combined with answering machine detection adds Direct Live Transfer where you send calls to your prospects and if answered by a human, the call is transferred directly to waiting agents on your call centre PBX. Calls that are answered by machines or are otherwise unanswered are simply abandoned. Newfies-Dialer has always supported press-1, which is playing recorded audio and inviting your prospect to press-1 to speak to an agent. The new power dialling mode means that Newfies-Dialer will not make more calls than your agents can handle. We have also introduced per user channel limits to only allow customers to consume the number of channels you allow them. There are a number of other new features, see the changelog Additionally, there are the usual performance enhancements and bug fixes. Contact us for a live demo or for more information.